Part A contains 9 chapters that describe the current knowledge of the physical science that underpins the process of aerosol sampling. Part B contains 4 chapters, which present the basis of standards for aerosols, including the link with human exposure by inhalation. Part C contains 7 chapters that cover the development of practical aerosol sampling instrumentation, and how technical designs and methods have evolved over the years in order that aerosol sampling may be carried out in a manner matching the health-related and other criteria that have been proposed as parts of standards. Finally Part D contains 6 chapters that describe how a wide range of aerosol sampling instruments have performed when they have been applied in the field in both occupational and ambient atmospheric environments, including how different instruments, nominally intended to measure the same aerosol fraction, compare when used side-by-side in the real world. 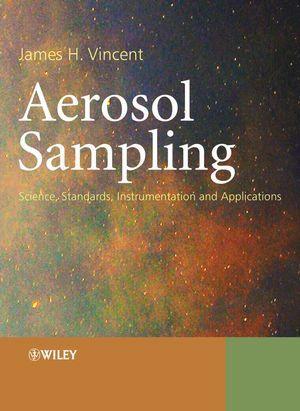 The book draws together all that is known about aerosol sampling, for the benefit of researchers and practitioners in occupational and environmental health and all other fields of science and engineering where aerosols are of interest. Professor Vincent holds a Ph.D. and a D.Sc. from the University of Durham, UK, the latter awarded in 1991 in consideration of "...work of high distinction constituting a substantial and original contribution to science." He is widely experienced in the occupational and environmental health sciences. He has worked in industry, in non-academic research institutions, and in three universities (Strathclyde University, University of Minnesota and the University of Michigan). His work over the past 30 years has included studies in aerosol science and fluid mechanics and their application to the atmospheric transport of pollutants, emission control from large-scale industrial processes, exposure assessment and control of airborne pollutants in environmental and occupational settings, aerosol sampling and measurement, inhalation toxicology and pharmacokinetics, occupational exposure standards setting, and international occupational health policy. In these areas he has published over 200 works. He is a past-president of the British Occupational Hygiene Society, was until recently chair of the Air Sampling Procedures Committee of the American Conference of Governmental Industrial Hygienists, and was editor-in-chief of the Journal of Aerosol Science from 1988 to 1999 (where he is now an honorary (lifetime) member of the Editorial Board.